Thermal ribbons compatible with the TEC B-SA4TM. BSA35110AG3F	 B-SA4TM Barcode Ribbon, 4.33" x 1148' Wax-Resin Ribbon, 1" Core, B-SA4TP/4TM COMPATIBLE, 10 rolls/case. Also available as a roll (Part# BSA35110AG3F-R). 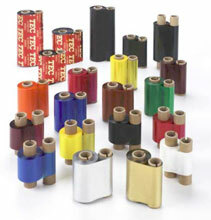 BSA35110AG3F-R	 B-SA4TM Barcode Ribbon, 4.33" x 1148' Wax-Resin Ribbon, 1" Core, B-SA4TP/4TM COMPATIBLE, Single roll. Also available as a case (Part# BSA35110AG3F).